A Tyvek sleeve is a type of disc packaging that is constructed like an envelope and may come with a clear plastic window. This form of packaging offers higher sleeve durability than those constructed from paper. Tyvek is a smooth, lightweight, nonwoven synthetic material developed by American chemical company DuPont and publicly introduced in 1967. The material’s characteristics make it a sturdy disc packaging solution, as Tyvek is waterproof and yet breathable and nearly damage resistant against tears and perforations. 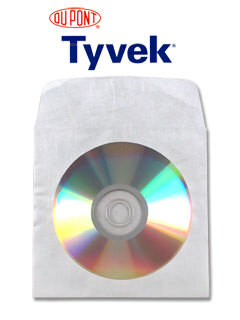 Tyvek is used in several other capacities besides CD sleeves that include but are not limited to: construction, vehicle covers, medical packaging, and hazmat apparel. The material weighs less than paper, which adds to its appeal when considering the potential for disc shipping or storage. Its smooth, nonabrasive surface is gentler on compact discs as one risks scratches and disc errors with paper packaging. A Tyvek CD sleeve’s basic measurements conform to the size of a disc. The rectangular sleeve measures approximately 5 1/8” x 5” when the closure flap is down. The transparent window allows users to easily identify discs by their viewable on-disc custom artwork. Variations include no transparent windows, various sleeve colors, or no closure flaps and are available on the market. Due to its thin dimensions, consumers will not see compact discs commercially distributed at retail stores in this type of packaging. While Tyvek shields the disc from superficial damage, it can only do so much against a limited amount of pressure and discs are therefore liable to breakage under certain conditions common to retail and shipment. They can, however, be custom printed by media duplication services although paper sleeves are far more popular and in demand for custom printing.